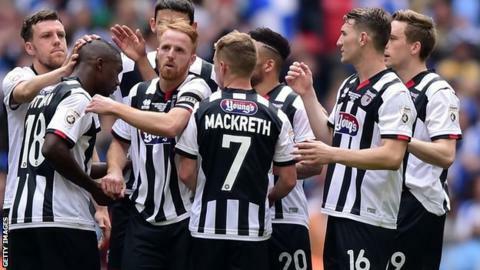 Grimsby have offered new deals to 12 players, including Jon-Paul Pittman, after their Conference play-off final defeat by Bristol Rovers. Striker Pittman, 27, missed the crucial penalty in Sunday's defeat. The Mariners want to keep captain Craig Disley, top scorer Lenell John-Lewis and defender Shaun Pearson. Carl Magnay, Nathan Arnold, Scott Brown, Craig Clay, Gregor Robertson, Josh Gowling, Toto Nsiala have also been offered new deals. However, the Blundell Park side have released eight players including striker Ross Hannah and midfielder Patrick McLaughlin. Caine Winfarrah, Paul Walker, Ellis Humble, Nick Draper, Paul Bignot, Hamish Watson are also leaving the club.